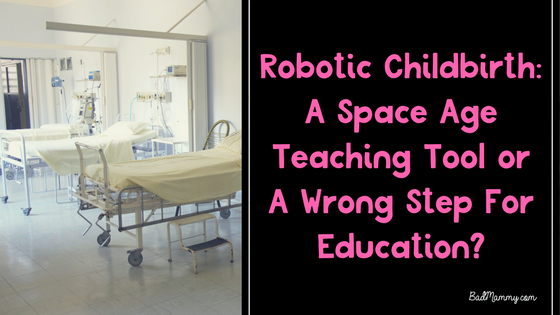 Robotic Childbirth: A Space Age Teaching Tool or A Wrong Step For Education? This week, a news story hit that the Royal College of Surgeons in Ireland has begun to use a robot for educating their students on the physical elements of childbirth. The news video included some (debatably creepy looking) footage of the robot in practice. Lucina, Ireland’s only “birthing mannequin”, has been purchased for €75,000 to benefit the surgical education of the future doctors taught in RCSI. The reaction to this news story has been mixed, to say the least. Some are horrified at the idea of a robot being used to teach doctors how to work in a childbirth setting. Others find it a genius idea which will likely improve outcomes for future patients as the educational tool will prove beneficial to the doctors in their training. So, what exactly is the reasoning behind the robot, what is it likely to teach that our current system doesn’t have, and is it all a bit of space age nonsense? This is not the first time that RCSI has used a simulation technique for educational purposes. The investment in this birthing mannequin is part of a much larger program which includes a surgical and training suite with clinical skills labs, a mock operating theatre and clinical training wards, which incorporates an €80 million investment. Birthing simulators are not brand new technology – they have been around in various stages of technological ability for much of the past three decades. This is however Ireland’s first brush with the robotic side of birth, and it is set to enhance the medical education of the thousands of students that pass through the facility. So, why use robots instead of real pregnant women anyway? The first reason for me is an obvious one – it’s much better for a student learning through making mistakes, to make them on a robot who doesn’t have a quality of life that will be impacted by any negative actions by the student doctor. It’s also much easier to find examples of different scenarios that can happen in the delivery room when you can set them on a program, instead of waiting for a real life scenario to happen. In many cases, the rarer situations can often only occur years into the doctor’s training and so they do not get a chance to practice and develop their skill prior to it affecting a real mother and baby. But, what of the bedside manner, cry some critics of the scheme. Yes, bedside manner is an essential component in medical education – but so is technical skill and technique in procedures. A lack of good bedside manner can leave patients with a bad taste in their mouth with regard to their treatment, but a lack of good surgical technique or medical knowhow can lead to fatalities, bad surgical outcomes and lasting problems for the health of the patient. When I was in hospital with hypertension which would later become pre-eclampsia, I was the toy of choice for the medical students who were doing rounds trying to gain experience. On a daily basis, I had at least one pairing come into my room, sit beside me with their notepad and note down my medical history. All of them did the obligatory gasp of horror at my tale of being hit by a car at 21 weeks pregnant, they pondered my duplex kidney and my ever climbing blood pressure. Some of them took a different approach than just medical history – they checked my blood pressure manually, they did the basic vital signs tests, and one even tried to take blood (word to the wise: do NOT allow this if you have shoddy veins, it’s NOT going to end well). All was fine, until one set of students decided to try to take a reading of the foetal heartbeat using a stethoscope. My little imp was a terror for going missing on the doppler, he was mischief incarnate from the start. So I knew for a fact that they hadn’t a hope of finding anything, and I knew he was good because he’d been on the doppler a few minutes previous. (The joys of my days stuck on the trace checking the pre-eclamspia wasn’t ready to take us both out). They put the stethoscope to my bump, took a listen, and then told me (the woman with soaring blood pressure and who had told them about the car accident she feared damaged her unborn child) that they couldn’t hear a heartbeat. There was no rushing to ask for a second opinion, they just blurted it out. I laughed it off, but in hindsight I’m now wondering if I wasn’t so sure, if I had doubts, just how much their words would have played on my mind. There is no doubt that bedside manner is something that definitely needs to be hammered home in medical schools. Childbirth is one of the most vulnerable positions a woman can be in, especially in this country where the 8th Amendment seems to give some medical practitioners an impression that their “My Way or the HighWay” approach is protected behind the law. But to decry the introduction of a robotic teaching tool as something that can make the education less valuable and depicting women moreso as vessels is to not look at the full image. There are also fears about the impression of over-medicalizing childbirth, and that the “three minute simulated labour” will give medical professionals an incorrect view of childbirth. I would hope that the robot is not considered to be an introduction to “How childbirth should be” but more to show the students examples of complications, of need for intervention. I’ve seen comments about the positioning of the robot – flat on it’s back, not a favorable labouring position at all, and I would hope that this is reflected in the training. However, some women (like me) are bound to stay in that position. I had a trace machine attached to me for the entirety of my induction bar a few minutes. This meant that when I attempted to try any other position (including the bouncy ball), the nightmare of keeping the trace on made it impossible. It was deemed of high importance due to my induction in the High Dependency Unit that the foetal heartbeat was monitored at all times. That’s a case where I would hope that students are taught a how-to before being tried out on a pregnant woman. For natural labour without complications, however, there is no need for medical intervention aside from midwife support. These are not the cases we need to worry about, not the ones we need to increase training levels for. I am very aware of the importance of language when it comes to speaking about bodily autonomy and how women in a vulnerable position are treated by those in authority. The #NotAVessel campaign is something I support, as I do believe that women need to be treated not as a number but as a real, live, breathing person. However, I also believe that medical care should be given to the best of a doctor’s ability, and any methods to increase training levels to that standard before letting them loose on one of those real, live, breathing patients can only lead to good things. Much criticism has been made of the Irish maternity care system in recent years, debunking the theory that Ireland is the “safest little country to have a baby in”. While yes, a number of these failing are down to doctors not listening to patients, there are also a significant number down to sheer medical error – caused by inexperience, lack of training or other accident. If we wish to reduce these numbers and reduce the negative impact on Irish women from our maternity health system, we should be looking to all possible avenues to increase the knowledge and training of our doctors in a way that has the least negative impact on patient care. What are your thoughts on the use of a birthing mannequin to teach medical students about childbirth? Let me know in the comments below, start a conversation, or comment over on Facebook. Are you on Instagram? So is BadMammy. Come over and say hi!